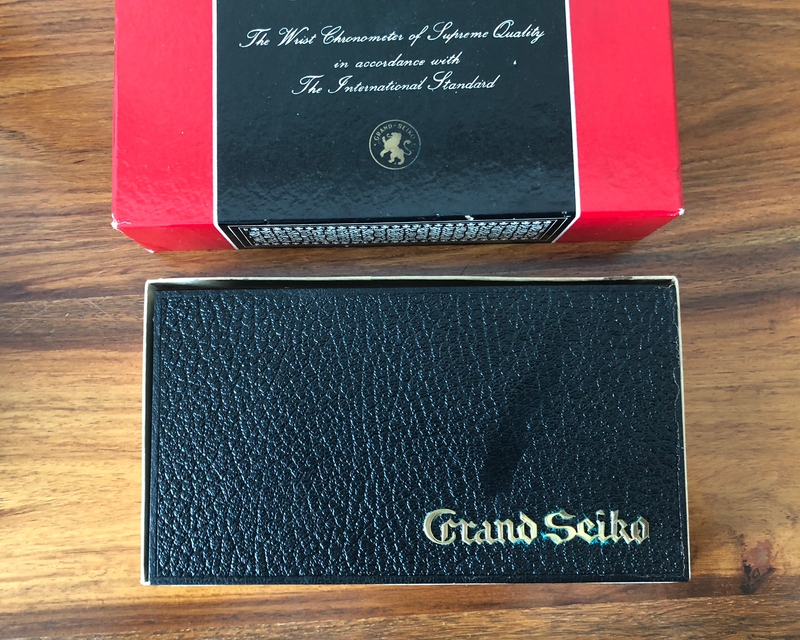 Unsurprisingly, given that these watches are well over 50 years old now, opportunities to purchase a Grand Seiko “First” complete with original boxes and matching chronometer certificate do not come by very often. 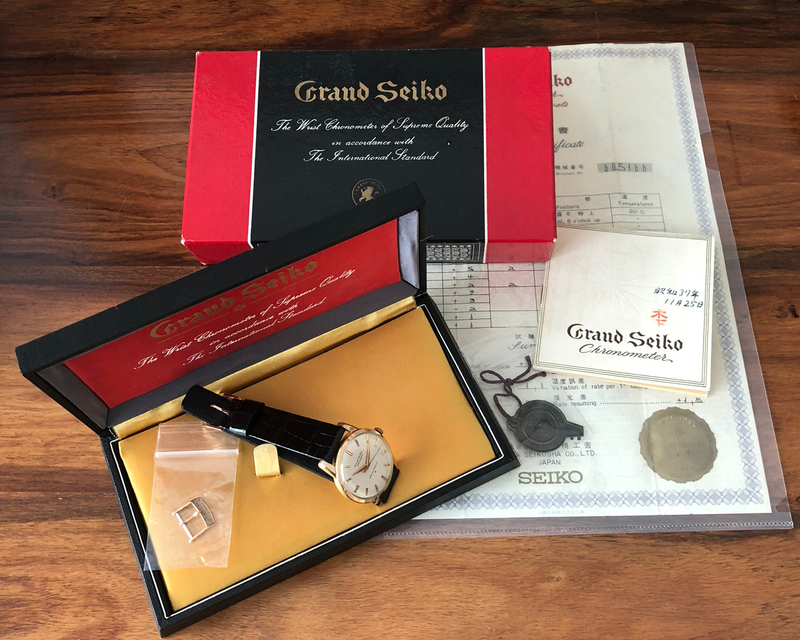 Presented here is a particularly nice example of the first Grand Seiko with the raised logo dial, complete with both inner and outer boxes, chronometer certificate, swing tag, manual, and an original buckle. 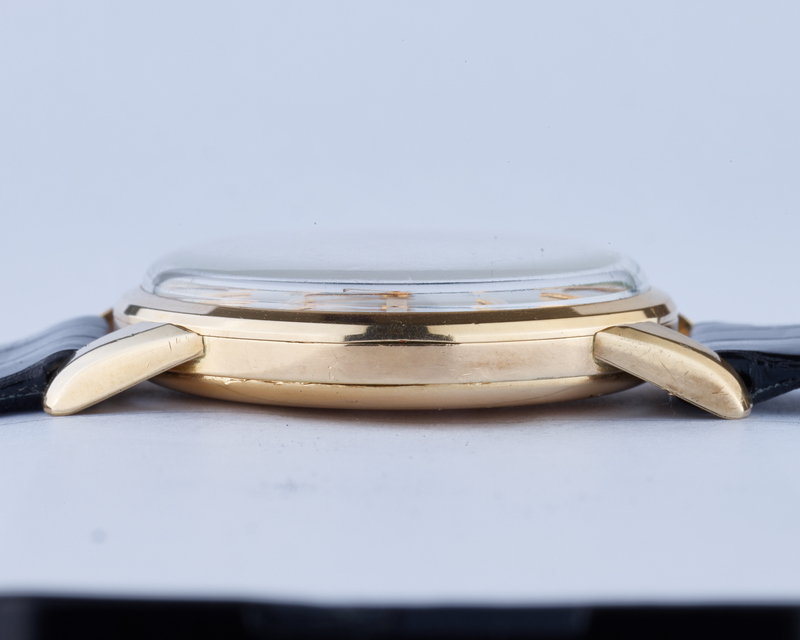 The watch itself, as can be seen in the provided images, is in excellent condition, with the case showing perhaps only minimal signs of polishing – the lugs maintaining their strong multi-faceted profile. The dial is also in great shape, with only very minor spotting and a couple of marks that can be clearly seen in the photos. 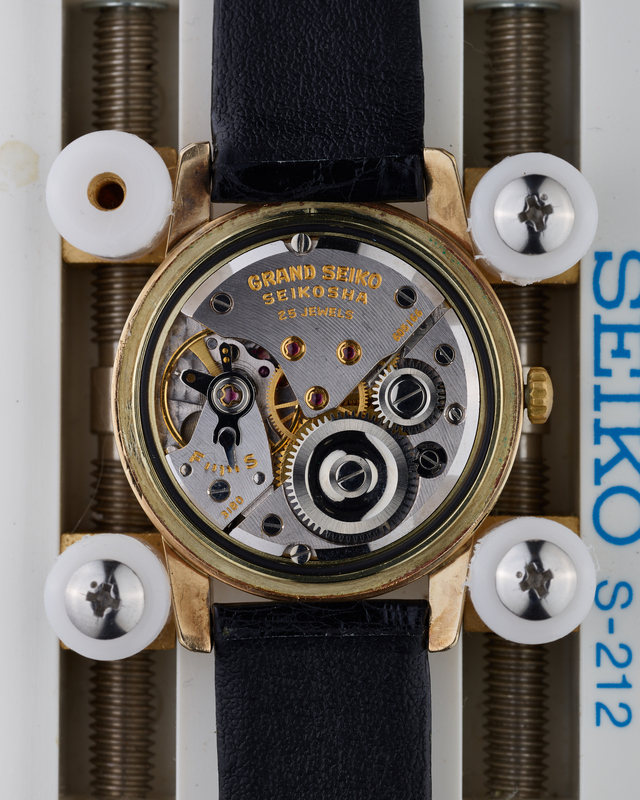 Looking at the certificate, it is interesting to note that whilst this watch has a relatively early movement – its number 605166 we believe indicating that the movement was manufactured in 1960, the date of the certificate itself is July 5th 1962. 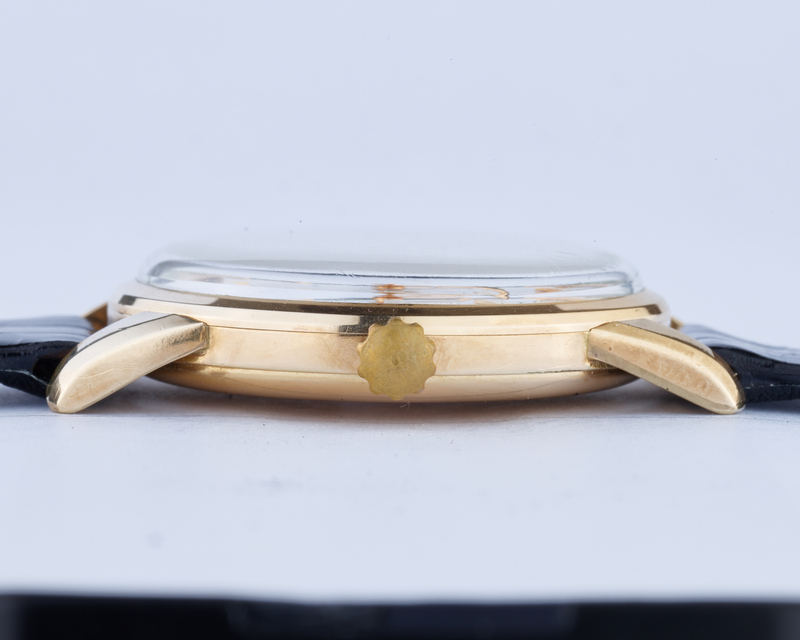 This is supported by the serial number of the case itself (visible on the inside of the case back), which starting with the numbers 22 indicates the watch was cased up in February of 1962. The above serves to indicate why it is so important from a scholarly perspective to come across watches such as this one. 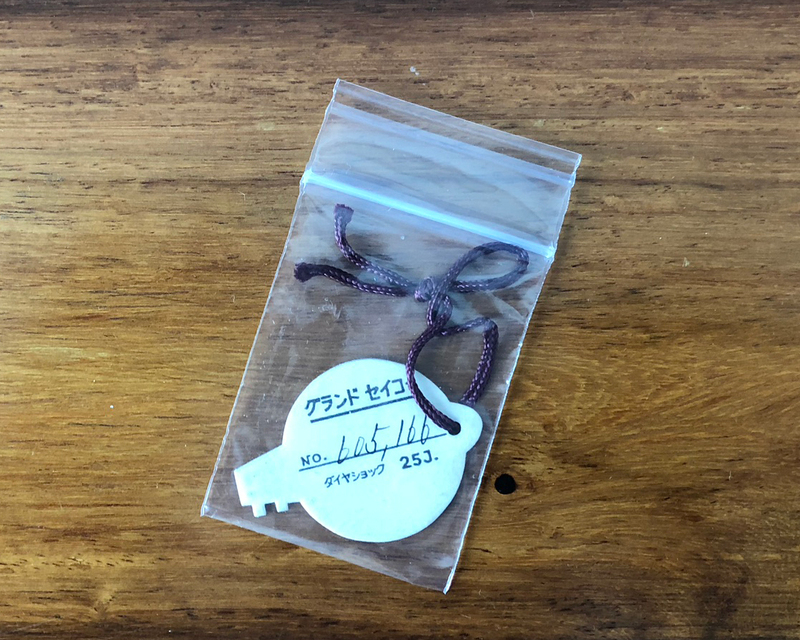 Without the certificate, it might be thought that a movement from 1960 in a watch case from 1962 could indicate a watch that had been cobbled together from disparate parts. The certificate however provides all the necessary proof that this is almost certainly not the case. 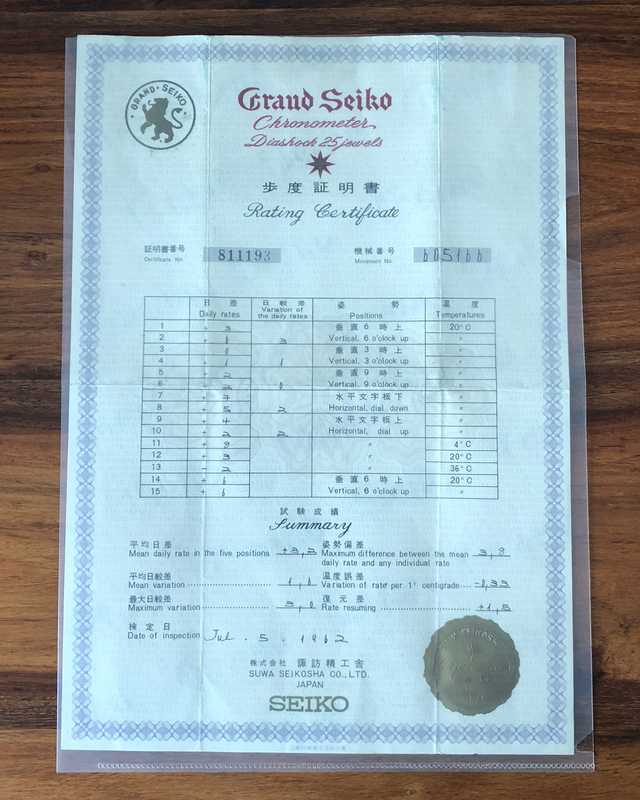 Now, because certificates for Grand Seiko “Firsts” only mention the movement number and not the case number, it is impossible to say with absolute certainty that any example of this reference has its original movement with its original case. However, in this instance the dates truly do all align correctly, so we believe it is more than fair to assume all is correct. 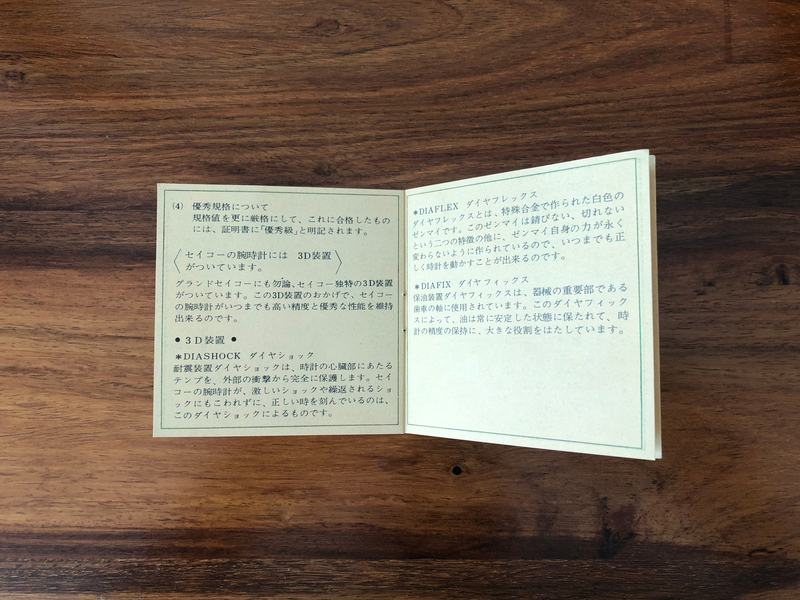 In addition to both inner and outer boxes and the certificate, this watch is also supplied with the original manual which remains in excellent condition, although do note that there is some writing on the front cover. Also supplied is the movement number swing-tag. This would have originally been tied to the watch so that the correct paperwork could be provided with the watch when it was originally sold. 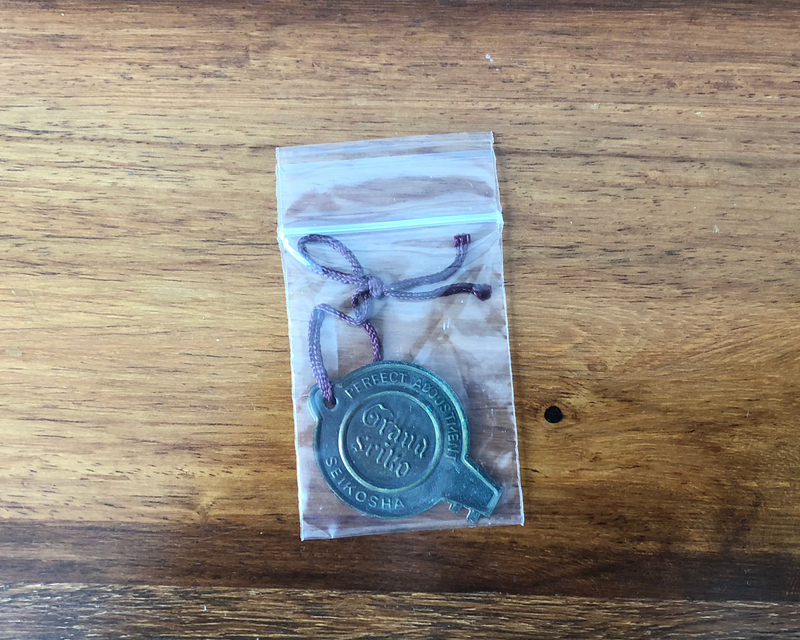 The swing-tag has the movement number of the watch written on the back so that the retailer could match it up with its correct certificate without having to pop off the case back. 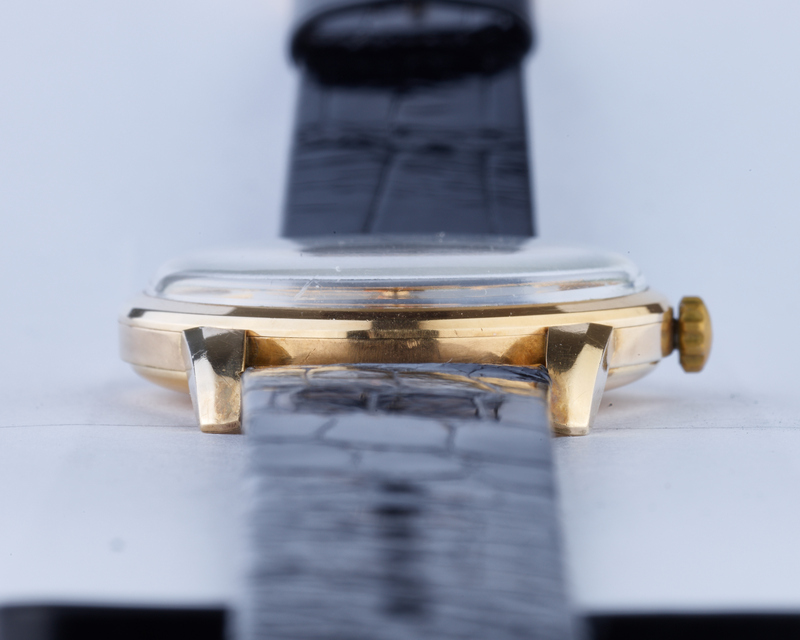 The watch is supplied on a new strap, with a modern Seiko buckle that is similar to the original, but of larger size. We believe this buckle is actually an electro-plated spare buckle from the SBGW253 steel reissue that was released in 2017. 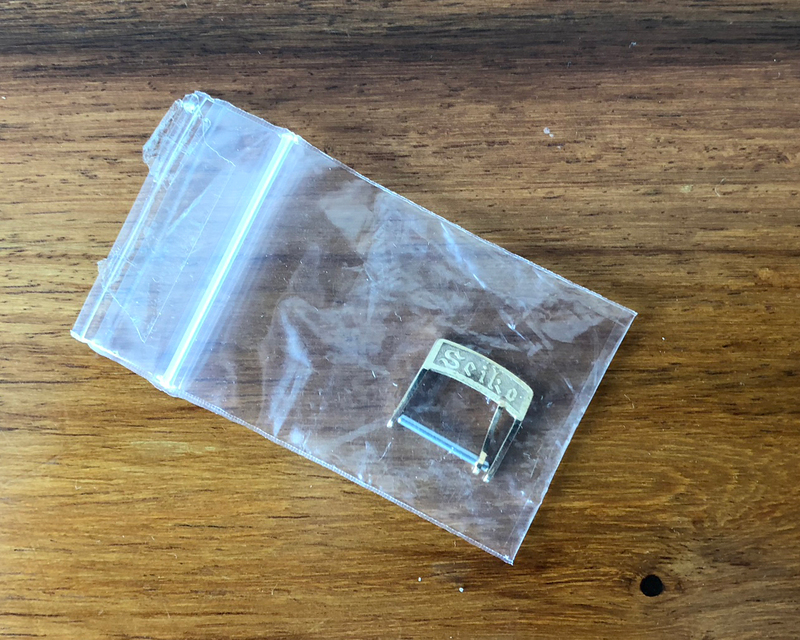 Please note that also provided with the watch is an original buckle (photo provided), should you wish to maintain 100% authenticity when wearing the watch. 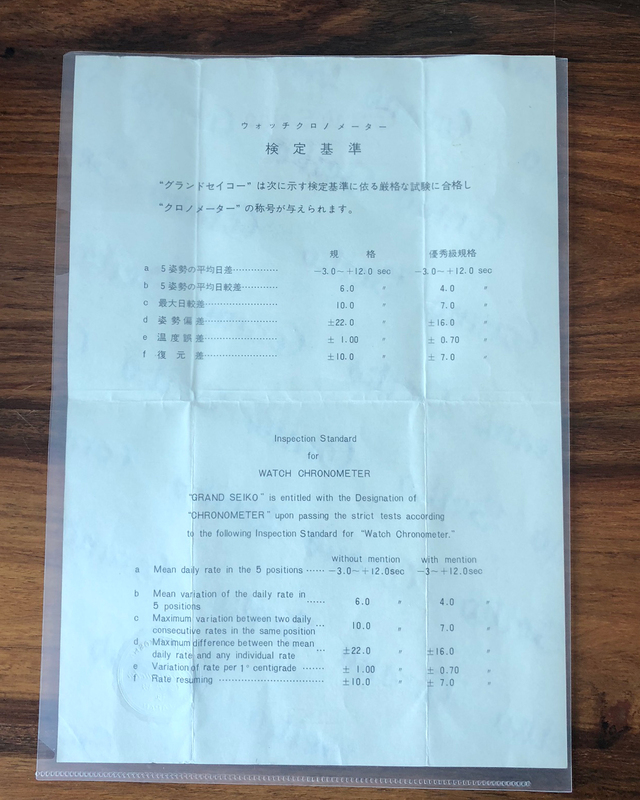 The watch was recently serviced by Grand Seiko, with the service paper showing a date of 16th June 2017. 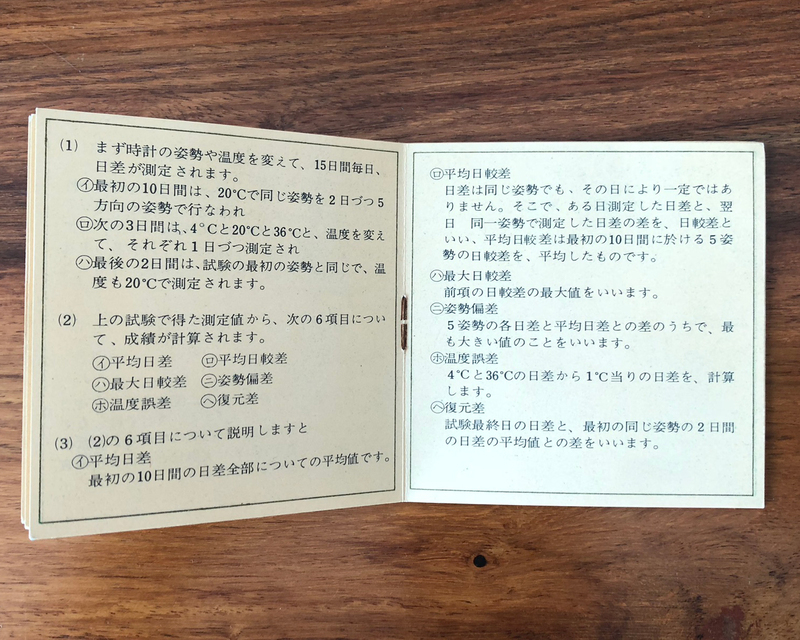 This service paper will be provided along with the watch. 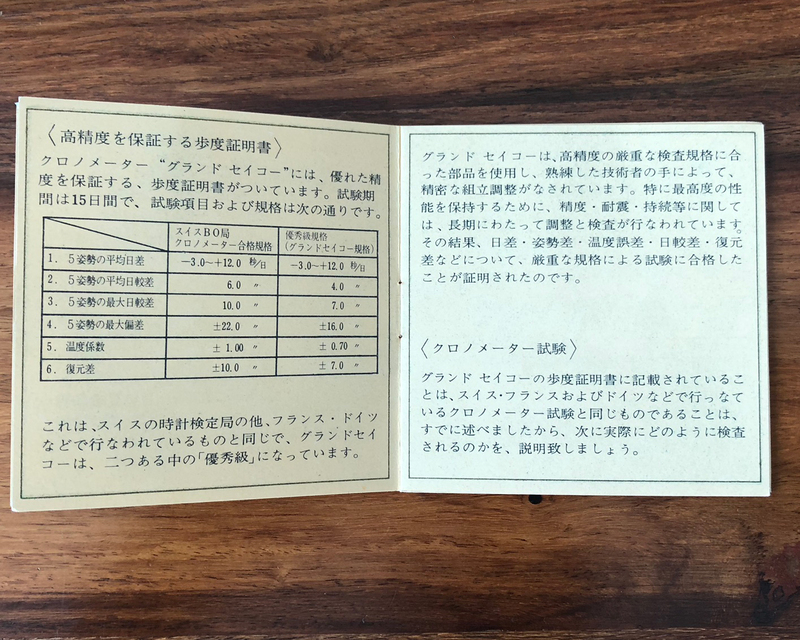 The service paper has the first 6 digits of the case serial number (221064) on it which identifies that it does belong with this watch. We are not entirely sure why the final digit of the serial number is missing, but that should be of no concern. In summary, on its own this would be a fabulous example of the first Grand Seiko to start off, or join, any collection. 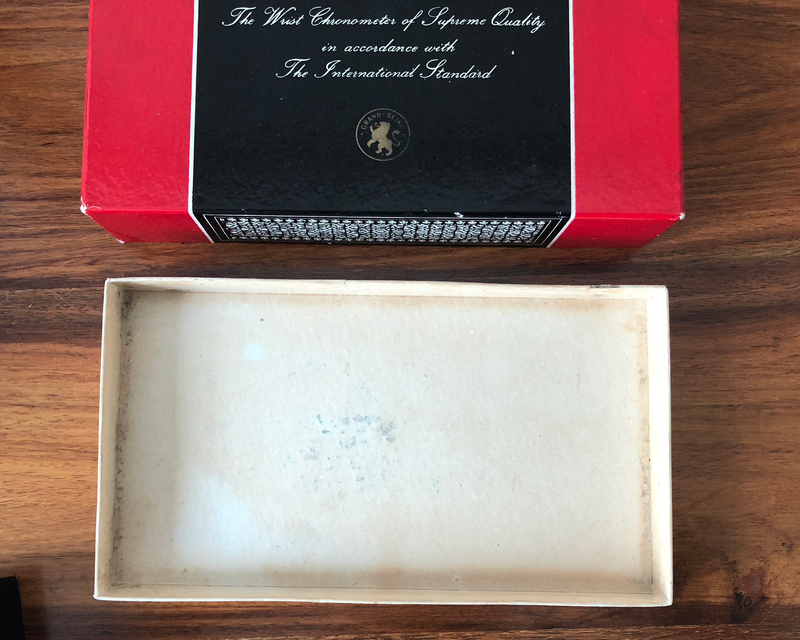 With all the accompanying paperwork, accessories and original boxes however, it really is elevated to be an extremely rare opportunity to purchase an item that could take pride of place in almost any collection. On a timegrapher in the dial-up position, the watch is running at around +5 seconds per day. 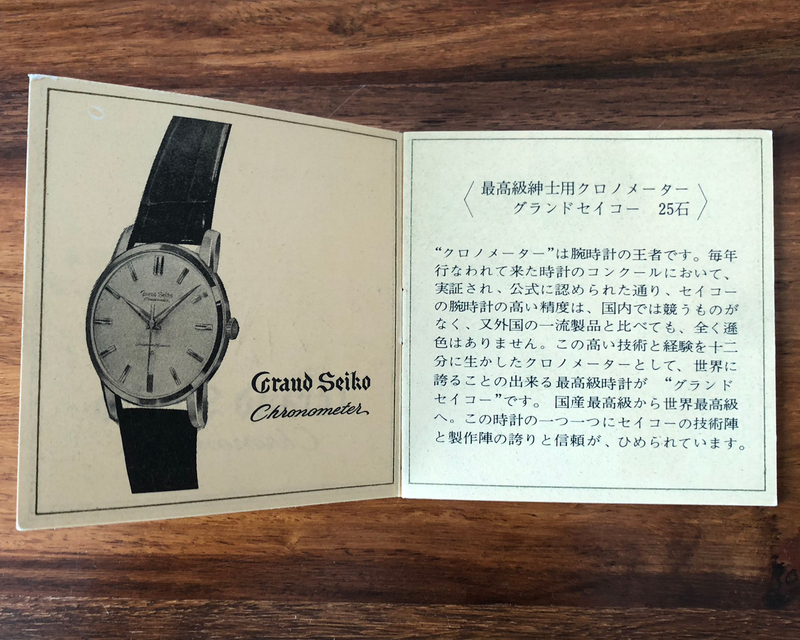 The first Grand Seiko was created in 1960 by the Suwa Seikosha company (now Seiko Epson) based in the Nagano prefecture in central Japan. 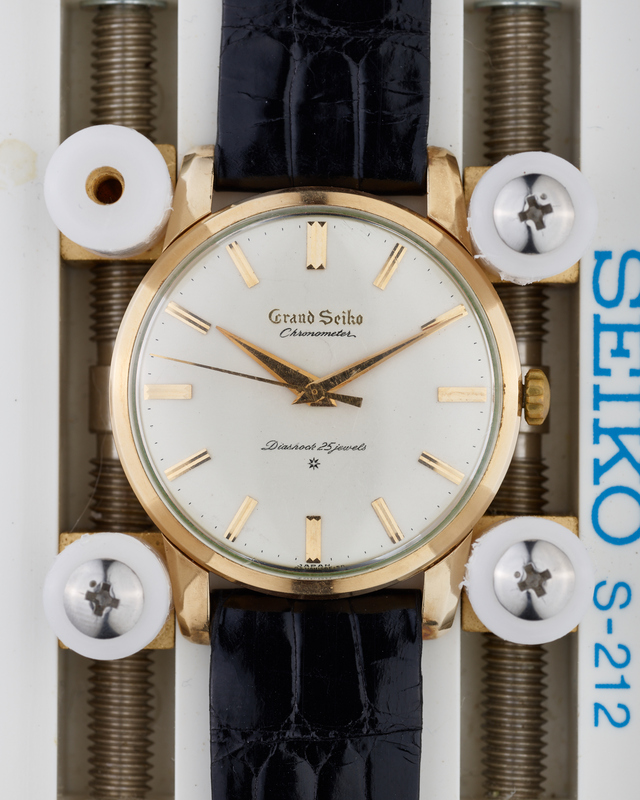 Born out of a desire to create a watch that was “as precise, durable, easy to wear and as beautiful as possible”, the Grand Seiko “First” was the start of what was to become a fascinating journey of continual development and innovation to create watches worthy of competing with – and indeed, beating – the very best that the Swiss had to offer. The new calibre “3180” was designed to be accurate to +12/-3 seconds per day, and was the first Japanese watch to receive a rating of excellence from the Bureaux Officiels de Controle de la Marche des Montres. Whilst only on sale for three short years – with total production believed to be no more than 36,000 units – there is a quite remarkable diversity of detailed features to be found on these watches. 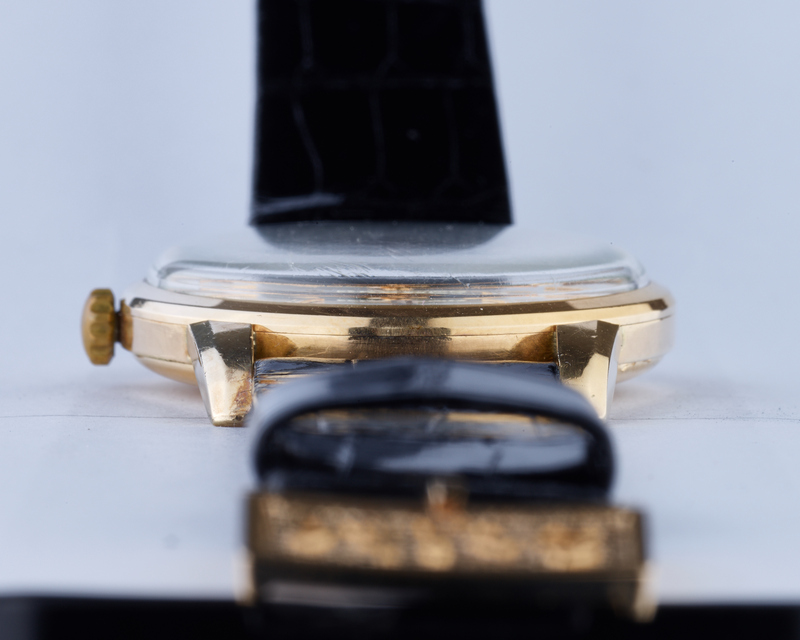 Watch production was almost entirely with cases made with 14K “gold filled” – where the gold covering to the non-precious metal case is 80 microns thick, of the order of ten times thicker than more traditional gold plating – along with extremely limited quantities in platinum. Concentrating on the 14K gold filled versions, there are variations in the dials, dial indices, hands, crowns and caseback medallions – examples of which you will see on the watches presented for sale here. 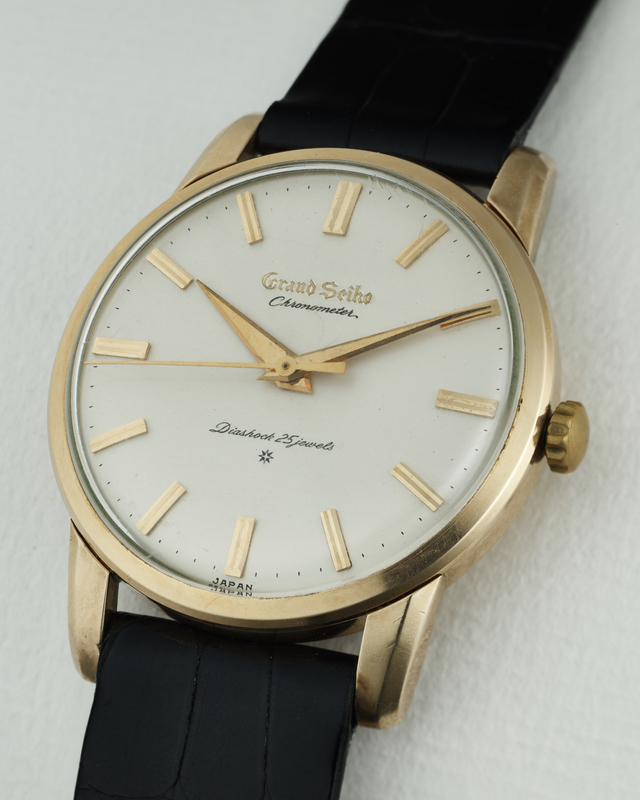 The most obvious feature that people concentrate on when looking to collect this model is the way that the “Grand Seiko” logo is created on the dial. There are three main variants here – printed, carved, and raised. 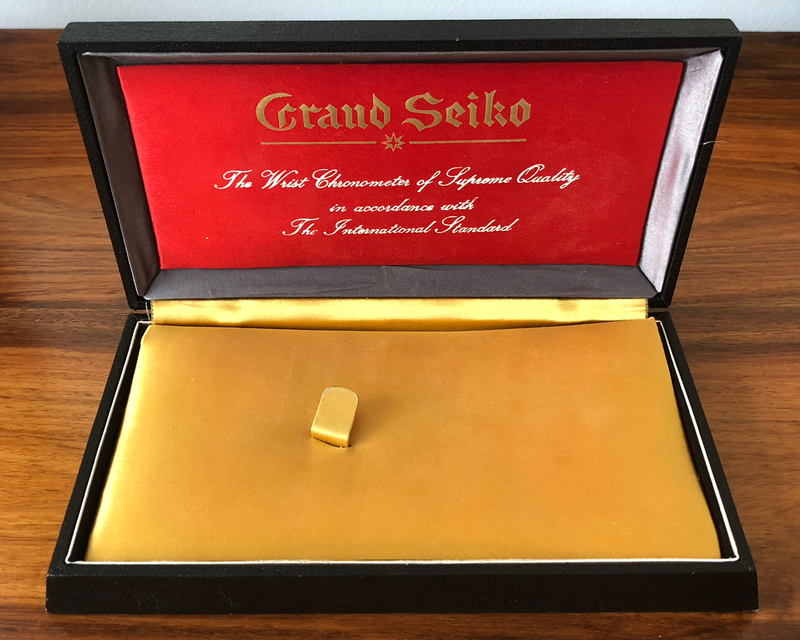 But even within those three core categories, there are sub-variants, some of which have only come to light relatively recently, as interest in collecting vintage Grand Seiko grows substantially with the marketing of the modern brand gaining significant traction globally. 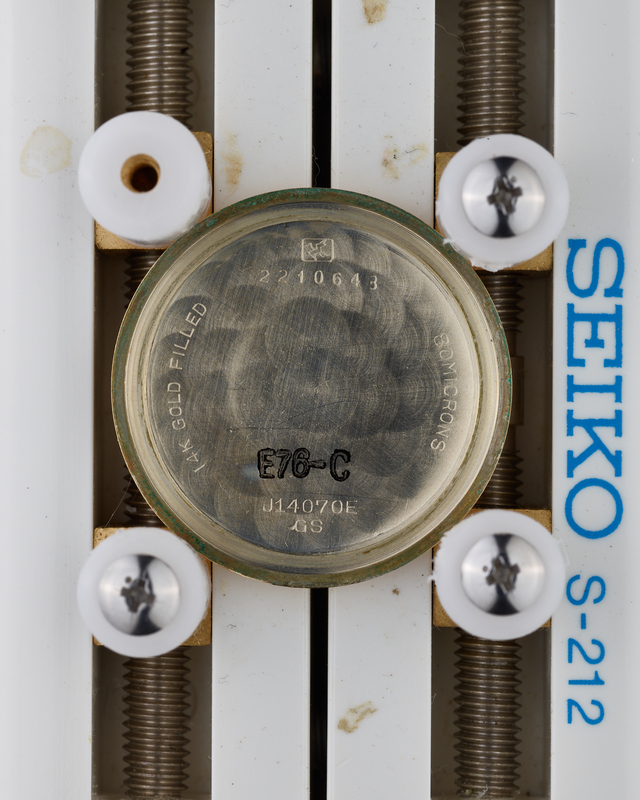 Based on movement and case serial numbers, it would appear that the printed and carved dial logo variants were actually produced in parallel. 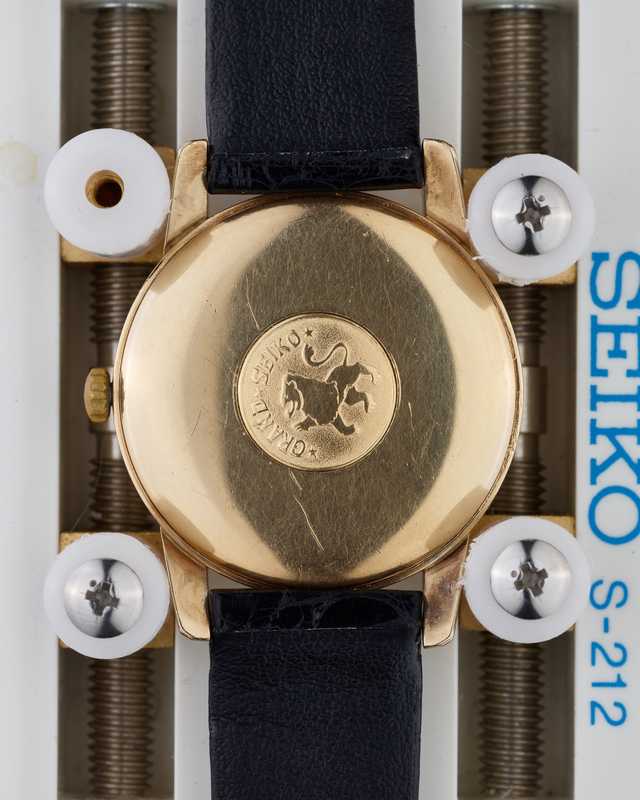 It is widely believed that the yields on the carved dials were not as high as needed to maintain production rates – which ultimately led to Seiko moving to the “raised” logo dial. Prior to this final transition however, it is clear that at least two different methods were used for carving the logo. From the look of the carved logos themselves, it would seem that the earlier examples used a process that was almost entirely manual, with the logo being engraved by hand with a pointed instrument, leading to a “V” shaped profile to the carving. The profile of the carving on later examples is characterised by a flattened-bottom “U” shape, which when examined in detail would appear to be achieved in a more mechanical manner. The printed logo examples seem to have been created alongside the earlier carved dial process, but in significantly smaller numbers. It is possible – although this is just conjecture on the author’s part – that printed dials were created to fill any shortfall in production numbers caused by lower than expected yields of the carved dials. Regardless of the background as to why the logo on the dial was produced in different ways over the course of the history of this model, there is no doubt that the printed example is extremely rare indeed – orders of magnitude rarer than either the carved or raised logo variants. Just how rare? 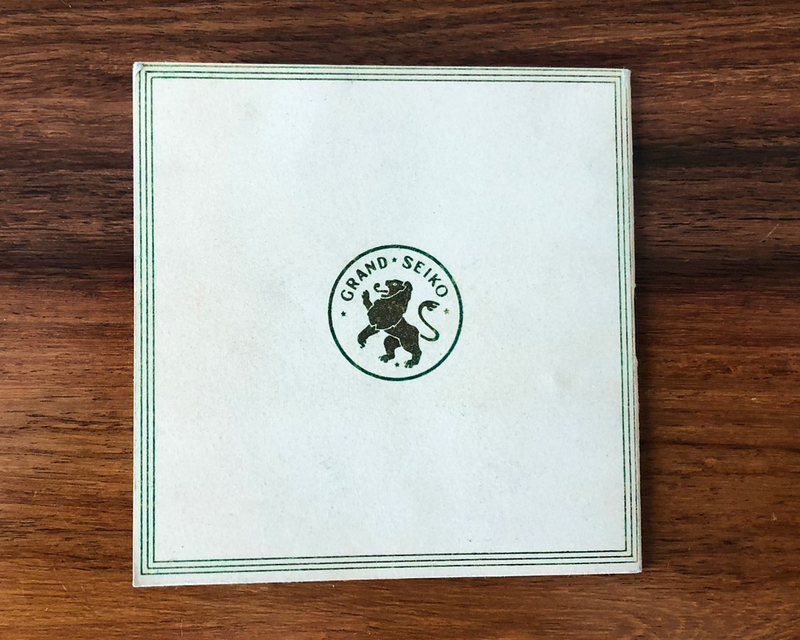 Well, in a recent discussion the author had with a Japanese dealer who has been buying and selling vintage Grand Seiko for over two decades, the dealer suggested that for every genuine (sadly, there are fakes out there) printed logo Grand Seiko “First” he came across, he would see something of the order of 3-500 examples of the raised logo variant. 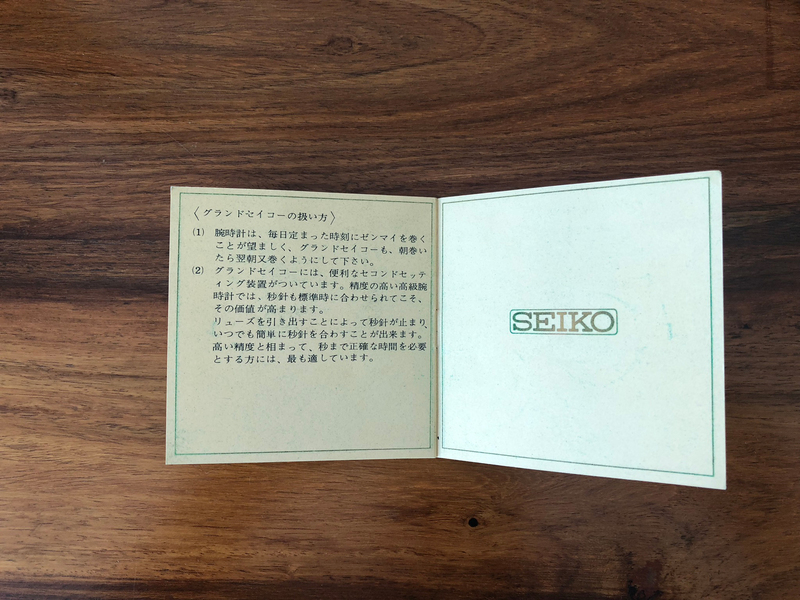 Whilst it perhaps may not be realistic to extrapolate this to the overall production, if one did, it could imply that there were fewer than 100 examples of the printed logo variant of the first Grand Seiko manufactured. This extrapolation does however seem to tally when examining the market for rare Seikos from the 1960’s over a period of several years. Certainly when comparing to watches such as the Seiko Astronomical Observatory Chronometer; the original Seiko Astron; and even the almost mythical 5718 “Counter Chrono” that was only ever on sale at the Olympic Village at the Tokyo Olympics in 1964, fewer examples of the printed dial 3180 have surfaced in recent years than any of those rarities. 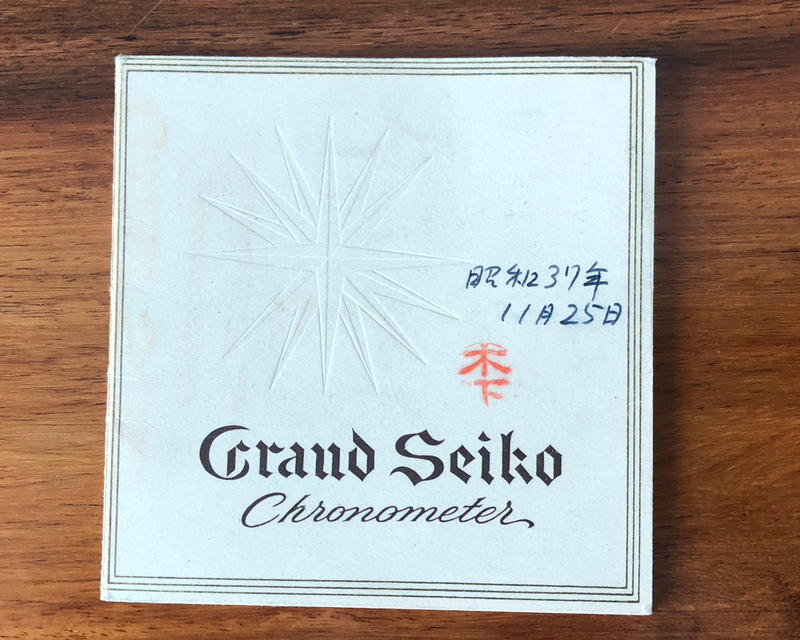 In addition to the “regular” print, carved and raised logo Grand Seiko “Firsts”, there are at least two other dial variants that should be mentioned. Firstly, there are “transitional” examples of dials with raised logos but with the same dial-code as the carved logo dials. These dials are extremely rare – almost certainly rarer than the carved dial variants. Secondly, there are also very rare “AD” dial variants, with raised logos, but a sunburst finish to the dial rather than the regular matte finish. 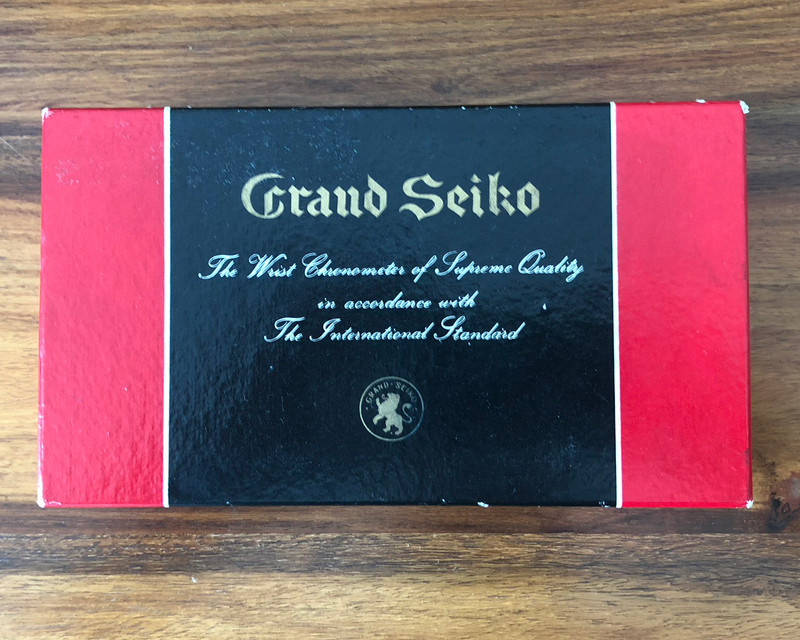 Currently it is not clear just how rare these AD dial Grand Seiko “Firsts” are – it is quite possible that some have been sold in the past without the seller (or indeed buyer) even realising what they were. However, what is certain is that no more than three examples have been positively identified on the market in the last five years – with most dealers and collectors not even aware of the model’s existence.